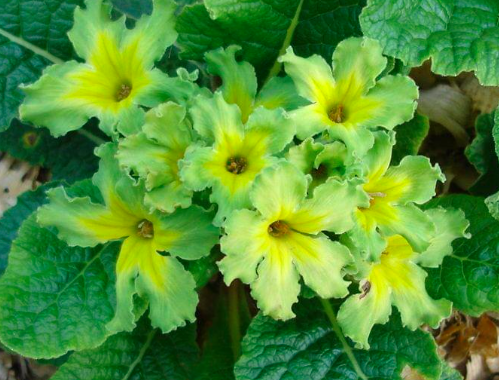 Not only does this odd primrose have truly grass green flowers – each with a central yellow eye, this form of common primrose is also the longest blooming of the species as well as a much easier long lived perennial. Frilly, almost semi-double flowers seem to last for months- remaining bright and fresh through almost all of spring. Makes a great little unique cut flower and the flower color mixes so well in the spring garden. Pair with the blue flowers of Omphalodes verna or even the white form ‘Alba’ as they bloom at the same time for the same length of time. Regular water in rich, moisture retentive soil. Regular summer water is a requirement.